The first point of protection in your home security set up is the FrontLine™ Wireless Driveway Alert System. Always be aware when guests or trespassers pull into your driveway or enter a restricted area with this compact motion alert system. Enjoy the flexibility of installing your Driveway Alert sensor anywhere on your property up to 300ft from your alarm unit. You can rest assured that the signal between your monitor and motion detector is strong and reliable at all times. Connect the hand held alarm unit to any security system that has a wire alarm input to alert you if motion is detected by your security cameras. Lifetime Live Customer Support Our customer support team can be reached by phone or by email and live web chat services, so you always have access to an expert. 2. Although the motion sensor is weather resistant, please note that it is not weather proof – Do not install in areas that receive a lot of direct rain and/or snow. 3. Battery life of motion sensor is 6-12 months based on tests of daily moderate use (10 times/day). Battery life may vary depending on usage. 4. Optimum range is 150ft when signal is passing through walls or floors. Microwave ovens (when in use) may cause signal disruption at close range. Buildings with metal frames may also cause signal disruption. Maximum transmission range is 300ft. 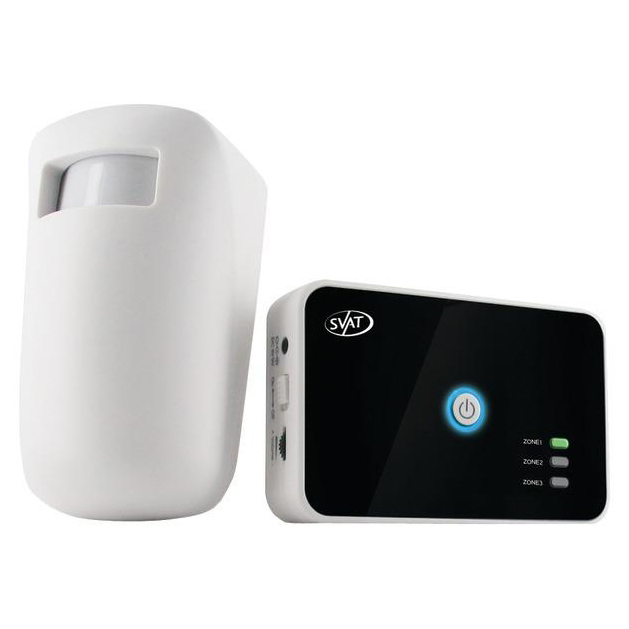 Motion sensor has multiple detection settings that affect the maximum distance and sensitivity of the unit. - Product may not be exactly as shown on the package. Some images are used for illustration purposes only. - SVAT does not endorse any SVAT products for illegal activities. SVAT is not responsible or liable in any way for any damage, vandalism, theft or any other action that may occur while a SVAT product is in use by the purchaser. 4.75" x 3" x 2"